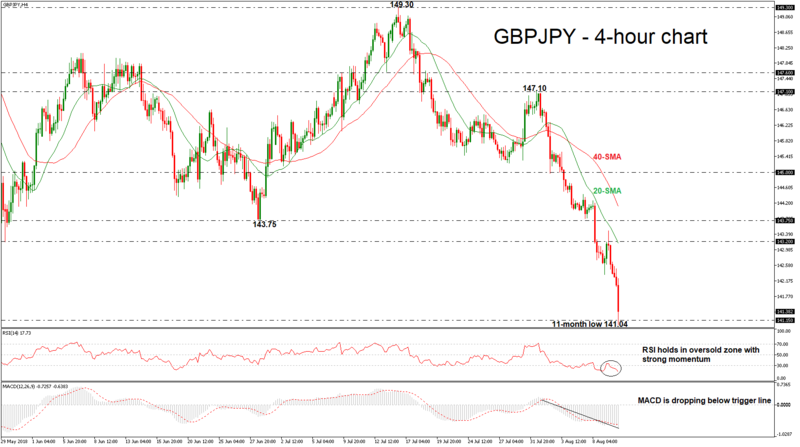 GBPJPY is recording a stunning bearish run this week, touching a fresh eleven-month low of 141.04 on Friday. The aggressive selling interest drove the pair below the 20- and 40-simple moving averages (SMAs) and the 143.20 key level, while the technical indicators suggest that the market could ease more in the short-term. In the 4-hour chart, the RSI indicator detects increasing negative momentum in the oversold zone and the MACD oscillator has dived below its red trigger line and stands far away from the zero line, both hinting that the next move in prices could be to the downside rather than to the upside. Should the market extend losses and have a closing day below the 141.15 support, which was last recorded on September 2017, that could see declines towards the 139.30 hurdle, taken from the trough on August 24. On the other side, if the pair bounces up, immediate resistance could be met at the 143.20 barrier, which stands near the 20-simple moving average (SMA) in the near term. Slightly higher, the 143.75 level could be a strong obstacle for the bulls. 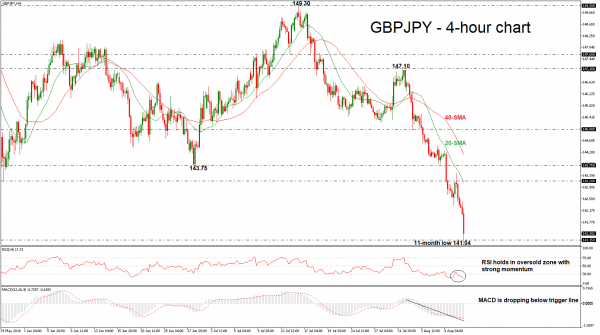 To sum up, looking at the longer timeframe, GBPJPY is set to complete the fourth consecutive negative week after the bounce off the 149.30 resistance hurdle.